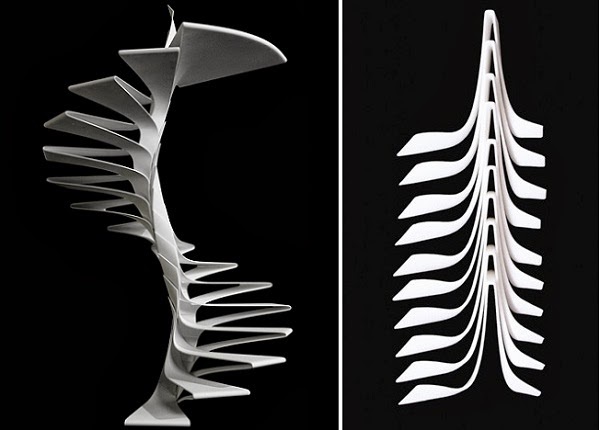 Italian studio Disguincio & Co has developed the concept of a spiral staircase, Folio Staircase with futuristic steps made ​​of reinforced carbon fiber. Principle structure - a repetitive sequence elements intertwined with each other and rotate in a spiral. 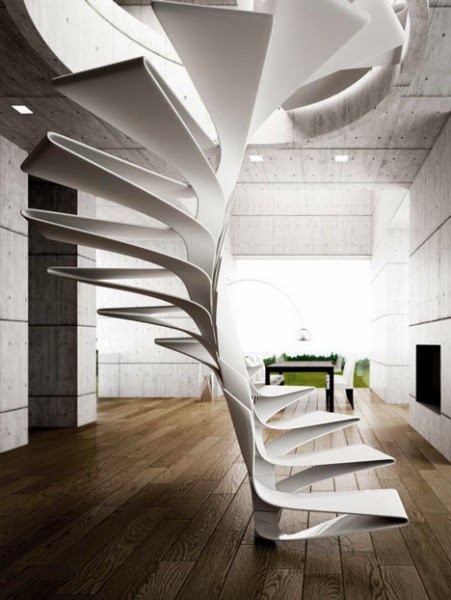 This ultra-modern interpretation of the spiral staircase is a translucent interior object , forming the spatial dynamics of the room. According to the authors of the project, each step is flexible and relatively weak, however, collected from a variety of steps such structure is very stable and reliable. GRP - only one of the options in the way the experiments with the materials for forming stairs. In future, more environmentally sustainable solutions using natural fibers and bio-polymer composites. At the moment there is only a concept as a ladder to test the strength of reinforced carbon fragment of glass. With creativity of the authors of the project can be found by visiting their official website design studio based in Pordenone.